Leah Gallant received her B.A. in Studio Art and Sociology/Anthropology from Swarthmore College in 2015. Her work strives to preserve the dignity of the material object by prioritizing fragility, transience, and transformation, traits elided by commercial illusion of the “long-lasting” product. Appropriate to her focus on loss—and consequently survival—her pieces scavenge and repurpose jumbled two and three-dimensional media. Gallant’s work is both a contemporary reframing of mid-century German conceptual artists and a reaction to the abstraction of post-digital art. 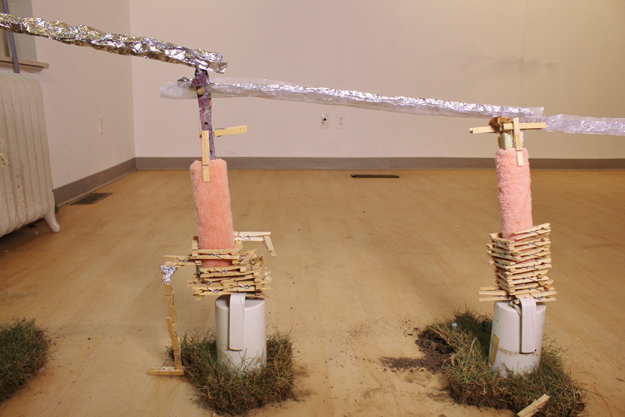 Aquaduct #1, October 2014, installation (turf, Easter grass, tin foil, ladder, water), dimensions variable. Sarah Kim: Your work is inspired by nature, the environment, organic shapes. 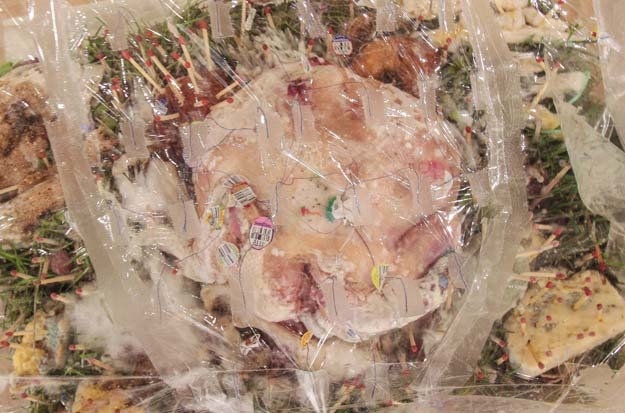 The most extreme material you’ve used thus far is the raw chicken carcass, which represents an intersection of commercial and natural. Leah Gallant: I’m drawn to how some organic forms can resemble others, but I actually don’t see working from nature as a huge part of my work. Where it does figure into my practice is as a way to curate some element of chance, as in the aqueducts that I’ve been building lately. The form of the channel matters to the artwork, but it’s only animated when water flows through it. I am trying to be more reflexive about how I use natural materials—so their relationship to the viewer and the artist are a large part of the work. The piece you’re referring to is an IRL vanitas painting. What I mean by this is that the medium associated with the genre—oil painting in the seventeenth century—is supposed to merely depict ephemeral objects while the image remains static. But here, the art object itself ages and grows mold in many beautiful shades of teal. Most immediately obvious is its sweet smell of decay, which was so ammoniac that the gallerist threw the piece out. I’m interesting in cultivating a blindness to exclusive readings of objects as commodities. Earplugs are obviously only ever earplugs, and matches are only ever matches, and so to use them in a drawing can momentarily destabilize their meanings. In unlearning their uses, I can pay attention to the peculiar aesthetic or structural properties of a material. And while natural resources too—wood, air, land—have been commodified, when they’re used in an artwork it doesn’t change my perception of that material. Basically I try to approach materials in the way birds build nests. Maybe birds are the best situationists. SK: Which artists have influenced your creative trajectory? Your current work borders on absentee performance, in the sense that there is a human element motivating the movement. This is the case with your aqueducts: you initiate the trickling of water, but you subsequently step back. There is a human mechanical force at play but the artist isn’t present—a kind of deism. LG: I’m interested in creating a set of possibilities for the work and letting it unfold by itself, letting some element—and again, often a natural element—introduce chance in order to complete the work. My primary influence for that aspect for the work, for creating an object or situation that performs for the viewer, where the artist’s hand is always implicit but invisible, is Roman Signer. I first encountered his work at the Museum of Modern Art, and it was this series of short films of simple object performances. For example, he tips a cup of flour off a door onto the floor, or he rides a bicycle that dispenses caution tape around and around two columns. The artist is not the protagonist, not the narrator, but more of an enabler or translator. Referencing Joseph Beuys, I’m drawn to the idea of creating a personal symbolic repertoire, collapsing the boundaries between art and life and working in interrelated media. Although I use symbols that have personal meaning, they’re derived from a more anthropological understanding of objects and spaces. For example, I draw on Mary Douglas’s Purity and Danger to use materials like that bright orange plastic fencing you see around construction sites to symbolize risk. My mold box piece is an experiment in bringing the unclean into the gallery space. By using produce stickers in it as gem-like decoration, I am treating them as units of value—an intentional misreading of both a symbol and material embodiment of capitalism. 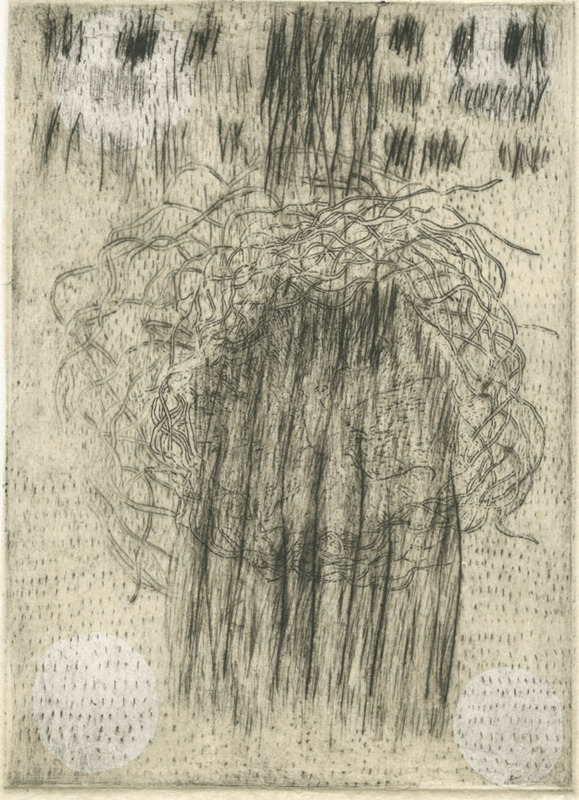 To return to your question about nature, I’ve been looking at Kiki Smith’s work for a while and I’m still very drawn to the way she has of creating images that are both beautiful and unsettling. But I’ve moved away from her work because I can’t make things that are so solemn. Mortality and the vanitas are the main components of my work, and since they are already heavy subjects, I need to treat them playfully. I can’t just cover everything in rust. SK: I want to return to your use of medium. Why did you make the transition from two-dimensional to three-dimensional media, and which of your own works do you consider as a turning point in your artistic development so far? LG: The turning point was the first aqueduct I made in my little studio. I had been trying to work on drawings and collages, but I was approaching them as decorative art objects—it had to look good and be visually successful, which prevented me from playing with it. The only way I figured to get out of this rut was to make an artwork that would fulfill a task, and the task was to carry water from one end of the room to the other. I built this aqueduct using a ladder, upside-down stools, clumps of turf someone had left outside from a hole they were digging, and all sorts of other things. That way I could pay attention to the visual composition of the aqueduct, but it had this other marker for success as an artwork, which was just to fulfill its function, sort of like a piece of furniture. Like a couch, it could be visually appealing, but it also has to work for you to sit on it. I do still work in drawing and journals a lot, but it’s now as interrelated pieces in a larger conceptual project. 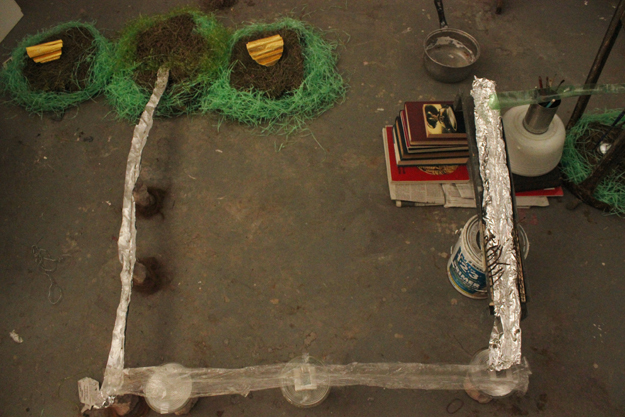 Aquaduct #3 (Basement Flooding Mechanism), May 2015, installation (turf, tin foil, paint rollers, Rolo’s, clothes pins, bagels, spaghetti, water), dimensions variable. SK: How does your work stand in relation to contemporary preoccupation with post-internet art, given that your work might be construed as old-fashioned or a rehash of past feminist artists? How do you respond to these possible critiques and what specific—not to be crass—value do you feel you offer your audience? LG: The artists that I look at the most have a relationship with the materiality of the work—Dieter Roth, Song Dong, and Wang Jin. I actually do think that materiality figures prominently in the practices of a lot of contemporary artists: Olga Balema, Brian Belott, Anicka Yi, Mika Rottenberg, Bryan Zanisnik. There’s definitely a Rothian strain that’s alive and kicking. These artists use non-art materials in ways that are both playful and intentional. But more often the way I see them used exemplifies what Sharon Butler calls the new casualism, this aesthetic of looking like you don’t care. When I use single-serving half-and-half cups or Rolos, I’m coming at it from a pretty specific standpoint of trying to displace meaning and open up form. Maybe I’m just old-fashioned, but the question of craft does matter to me. It’s certainly easy to make bad art with a high skill level, to be a technically strong painter and make bad paintings. But I do think that it’s important to make work formally strong. 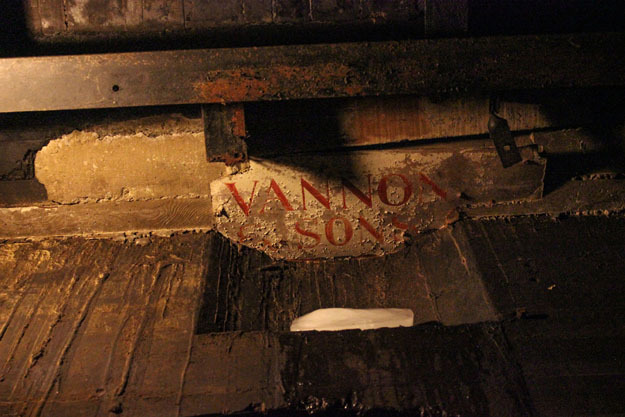 Vannon – Veins, August 2016, installation, dimensions variable. SK: What are you as an artist philosophically? LG: The work I did at the Birdsell Project, an artist residency program in South Bend, Indiana that opens underused spaces to installation art, was a sort of object biography-inspired aqueduct. I’m currently working on this egg tempera painting of ice in a canvas bag as documentation of part of this piece. I’m thinking about John Berger’s characterization of egg tempera as a medium used to document the miraculous, whereas oil painting was more suited to document possessions and humanistic scenes. I feel this deep belly interest towards applying material culture studies to follow an object back to its origin and earlier uses. This has given me the idea of more directly smushing anthropology, which I also studied, into art practice — maybe doing fieldwork as the basis for paintings. Serge Gruzinski, in his book Images at War, describes how in Mexico missionaries gave a group of indigenous people a picture of the Virgin Mary. They immediately buried it and pissed on it in order to make the crops grow because that was how their images acted: as objects with power, as animate things that had a function that was integrated into life and culture. It’s not at all a division between Eastern and Western art, or even between different time periods—medieval reliquaries also have this animist quality about them—but rather different ways of living around images.